The costotransverse joint is an articulation between the articular costal tubercle of the rib and the costal facet of the transverse process of a thoracic vertebra. 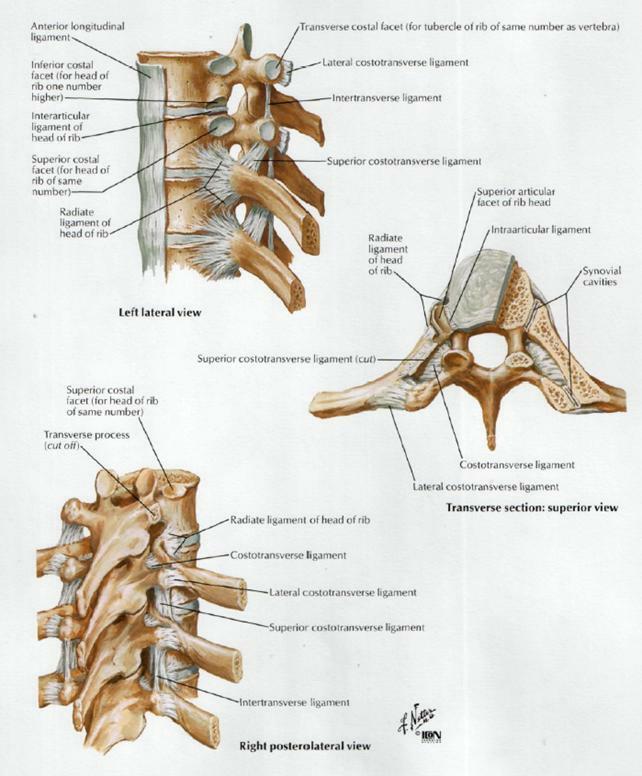 The costovertebral joint is the articulation between the costal facte or demi-facets (formed by the caudal side of the superior vertebra and the cranial side of the inferior vertebra) and the head of the rib  These facets form a solid angle whose base consists of the annulus fibrosis of the intervertebral disc. A synovial joint ensures the connection between the rib and the thoracic vertebra. Together with the thoracic cage, the costovertebral and costotransverse joints provide stability. Bucket handle motion: One end of the rib is fixed at the vertebral end, the majority of the rib elevation occurs through upward excursion of the lateral position. This motion increases the transverse diameter of the rib cage. Pump handle motion: One end is fixed, and the free end describes an arc. When the ribs move around the axis, the anterioposterior diameter of the rib cage increases. 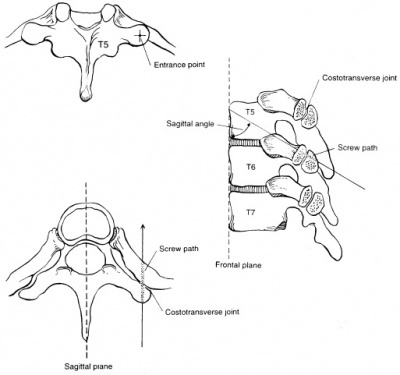 Caliper motion: The 11th and 12th ribs have only costovertebral articulations. The motion produces slight changes in both the transverse and the anteroposterior dimension. All twelve ribs have pump handle and bucket handle movements, but the upper ribs have a greater pump handle motion and the lower ones have more bucket handle type movements. Though distinctly unusual at the costotransverse and costovertebral joint, rheumatoid artritis can occur in these joints. > focal tenderness over affected intercost. Pain is measured with a numeric pain scale (VAS), whilst function is measured with the Dallas Pain Questionnaire and Functional Rating Index. In an unstable thoracic spine (caused by trauma, degenerative conditions, tumors and deformities) posterior instrumentation and fusion are commonly used as treatment. 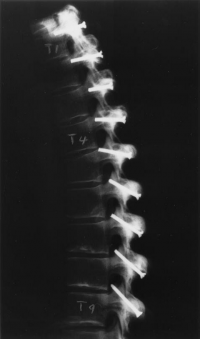 Numerous techniques have been reported to restore spinal stability and correct spinal deformities. Posterior fixation of the thoracic spine through the costotransverse joint may be an alternative (figure 2). Thanapipatsiri and Chan  showed that posterior thoracic fixation through the transverse processes is safe as implants placed beneath the transverse processes are away from the parietal pleura and the intercostal vessels and nerves. Heller et al. demonstrated that transverse process screws were weaker biomechanically than pedicle screws in the upper thoracic spine, but safer technically  Fixation around the transverse processes in the thoracic spine appears to be simple and safe, but fixation through the costotransverse joint may be more rigid than through the transverse process. Injury of the intercostal neurovascular structures. Injury of the parietal pleura. Fixation at multiple levels may result in limitation of movement of the thoracic cage and may affect the long function. Patients with upper back pain, pain between the ribs and thorax pain may be candidates for a costotransverse or costovertebral joint injection. The injections have two purposes: to confirm the diagnosis that these joints are the source of the back pain and secondly, to offer temporary pain relief. Mobilisation of the rib is in an anteroposterior direction, using oscillations with contact on the dorsal surface of the rib, adjacent to the thoracic spinal articulation  (figure 3). Rib distraction mobilisations can be an effective initial treatment. This technique is best done with the patient in a sitting or prone position. Treatment of pain, rather than stiffness. Dorsal glides of the thoracic spinal facet joints (via the ribcage)  . Mobilisations of the costovertebral and costosternal joints: large amplitude P/A oscillations of the ribs in prone position. Chest lifts may be a useful generic treatment technique for a rib articular dysfunction or thoracic facet joint dysfunction. With the patient in hand and knee position, reach underneath the chest with both hands, lace fingers together, and slowly and gently lift the torso. Repeat this manoeuvre a few times, slowly and rhythmically, lifting from different portions of the chest or sternum to create a movement at different segments of the thoracic spine. These techniques should be pain free. Tape two tennis balls together to create an ellipse shaped ball. Place the balls on the segmental level below the on to be mobilised. Slowly lift the shoulders off the floor. Hold this position for 3 seconds. Lie down on the balls. Bring the shoulders to 90 degrees abduction. Draw circles with the wrist in a clockwise and then counterclockwise motion. This condition is often overlooked yet it can be responsible for pain in the thoracic region or functional impairments of the thoracic spine. It may occur due to trauma, degenerative changes, tumours, deformities or muscular spasm. Differential diagnosis are numerous and pain can be referred into the neck and/or head. A diagnosis is usually made through a clinical examination with treatment consisting of mobilisation, exercise therpay, injections and/or fixation of unstable joints. ↑ 4.0 4.1 4.2 4.3 4.4 4.5 Edge-Hughes, L. Canine Thoracic Costovertebral and Costotransverse Joints: Three Case Reports of Dysfunction and Manual Therapy Guidelines for Assessment and Treatment of These Structures. Topics in Compan An Med; 29, 1: 1–5. ↑ Thomas E. Hyde, Conservative Management of Sports Injuries. Jones and Barlett Publishers, 2007, p440. ↑ 12.0 12.1 12.2 12.3 12.4 12.5 Hudes, K. Low-tech rehabilitation and management of a 64 year old male patient with acute idiopathic onset of costochondritis. Family Chiropractic & Rehabilitation, (2008) 52 (4), 224-228. ↑ Williams EH et al. Neurectomy for treatment of intercostal neuralgia. Ann Thorac Surg (2008) May;85(5):1766-70. ↑ Walter R, Essentials of Physical Medicine and Rehabilitation. Elsevier Saunders, Philadelphia, 2008, p 576. ↑ 22.0 22.1 Haasenritter J et al. Does the patient with chest pain have a coronary heart disease? Diagnostic value of single symptoms and signs – a meta-analysis. Croat Med J (2012) Oct;53(5):432-41. ↑ Scaringe JG, Ketner C. Manual methods for the treatment of rib dysfunctions and associated functional lesions. Topics in Clinical Chiropractic. (1999);6:20-38. ↑ Triano JJ et al. Costoverebral and costotransverse joint pain: a commonly overlooked pain generator. Topics in Clinical Chiropractic. (1999);6:79-92.